I know it's been talked about a lot, but I'm looking for a new 5th wheel hitch. I currently have a reece 15k slider hitch. I've had this hitch for able 8 years, my dad had it before me for maybe another 6. With my old f250 I needed to slide it for maneuvering. About 2 years ago I bought a GMC 2500 sb and gave not had to move it since. The axle is further back on a GMC and I think if I did slide it, it would get into the tailgate. With that said the old reece hitch is starting to make a lot of noise and I'm looking for a new one. I've narrowed it down to about 2 that I like, but I'm open to options. Id like to keep it to around 5-600 dollars if I can. Only must haves are it must not slide, and it had to have a positive lock on the handle, meaning something I can pin closed. The 2 that I've found that I think I like are as follows. Doesn't seem too bad for$430. Should do everything I want it to. The other one is a b&w Patriot. I know b&w makes great stuff. I like the looks of it, the only problem I see it that minimum height is 16". I just measured my hitch at 15". That's pretty important do to how I have to get in and out of my driveway. What's your thoughts? I appreciate all the help, Clayton. Curt hitches are known to cause chucking as their head pivot point is several inches below the kingpin connection. They are not always easy to get unhitched. CURT 5er hithches are Made In CHINA. Spend the money buy the best. B&W top quality USMade. Simple solid latching system. No question if you are hitched. What ever hitch you decide on take a look on craigs list for it. Pretty much everyone made can be found there for some pretty good deals. I picked up a Kurt 20K for $200 that was like new. Have towed over 10,000 miles with it and no chucking or disconnecting issues at all. The Patriot is the obvious choice! It is top quality, at a reasonable price. It is very user friendly, quiet, positive latching jaws, locking handle. No question about being properly hooked. It seems your concern is towing a bit nose high, causing the rear to drag on driveway. Depending how much bed rail clearance, you may have to raise the trailer a bit. Is your pin box on trailer set up all the way? You are correct the GM has a little longer distance from rear axle center, to cab, than your Ford. The Patriot has lots of adjustment ahead/back, and would have worked well in your Ford too. B&W ! Multiple adjustments. Have on on rails in truck below. LOVE IT !!! 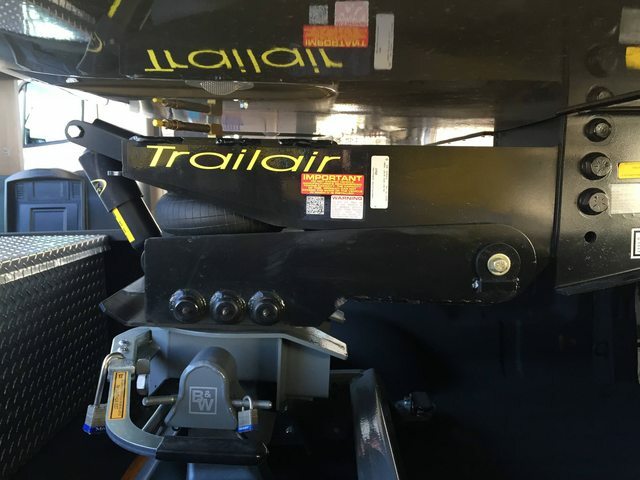 "The best part of RVing and Snowmobiling is spending time with family and friends"
Curt owners thinks it does when we look around the net at other trailering forums. Pay attention to what Curt owners say (not just one Curt owner or other brand owners/brand bashers think). Same with the B&W owners. Pay attention to their likes about their B&W and ignore their bashing other brands. Just like a which is best truck, a Ram or a Ford, thread. Thanks for the help. I see one Patriot used relatively close to me. I don't think about raising my pin box, I'll look at that, that may make up the difference. One other option could be a gooseneck adapter. I currently have a Curt "spider" style gooseneck hitch for my 5th wheel rails. I pulled my friends gooseneck trailer with it and it was silent which is one reason of getting rid of the slider hitch. What are the thoughts of using a gooseneck adapter? It seems like it would be a lot more difficult to hook up. Not many 5th wheel trailer mfg recommend a GN adapter. I think some of the heavier built trailers are designed for using a GN adapter and even have it as a option. Your brand trailer mfg can best answer that question. You can add something the Reese goose box system. Or do like many who pull GN trailer is go with a different style hitch like the clicky link PullRite. or the same style clicky link Andersen. 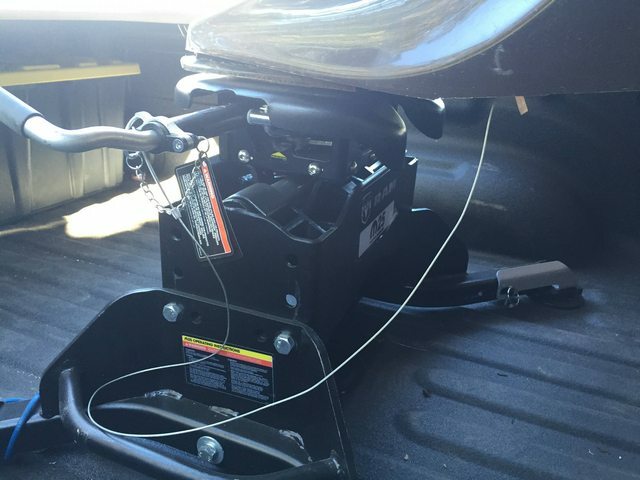 I have a Reese above bed floor GN style hitch, similar to the Curt, I use for my GN trailers. That way I can use it in the wifes 1500 chevy or my other trucks. I found the Patriot I currently use on Craig's List. You can't buy a better hitch without going to one of the air-ride hitches and I've had gooseneck, Reese, & 2 AUH ..
You can see what I am talking about, B&W's pivot is right at the kingpin height where the CURT is several inches lower. Compare the latching system, B&W is a simple solid handle that can be mechanically attached and the CURT has a slide handle with a flimsy locking system. I have personally hitched and unhitched the CURT below and is not always easy to release on a twisted surface as in truck leaning right and RV leaning left. The CURT owner is an in-law and wishes he had the B&W. His came with the RAM DRW.